Hello, I have read a lot of good info on this forum about sound reductions/sound proofing and would like a few opinions on my specific set up. 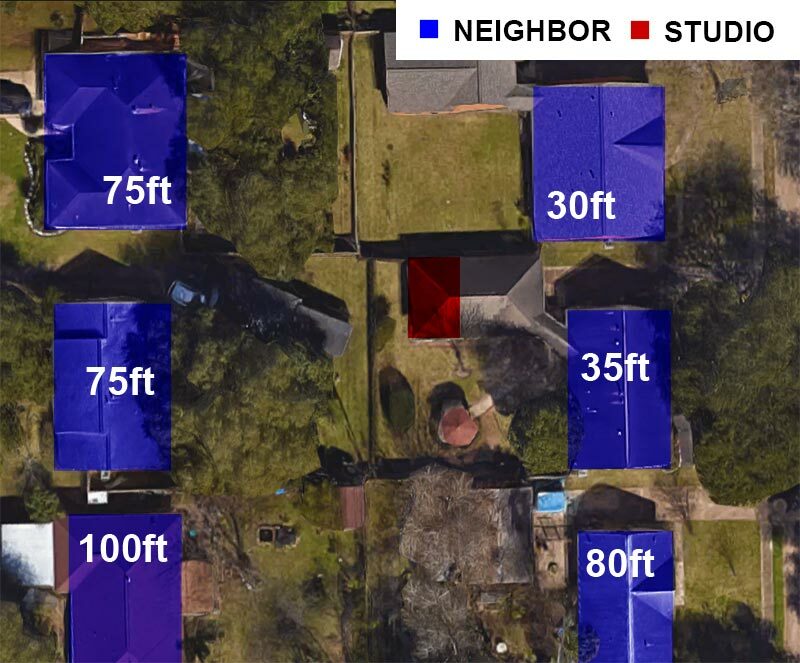 I have included a map showing the studio and my neighbors with the distance between them. To create a satisfactory sound reduction in my new jam space so my band can practice without ANY possibility of neighbor complaints. I prolly don't need to soundproof completely but do not want any neighbors hearing me in their homes or barely outside. 2. Do I need quietrock? Locally sold for $50 a sheet. 4. Are there better options in the same budget range these days? if you are playing drums and/or bass guitar you had better decouple the system or build room in a room otherwise all the bass will get to your neighbors with ease. You need to decouple, increase the mass to at least 10lbs per sqft. I understand that soundproofing is not cheap but the last thing you want to do is spend good money on things that do not work... it might take some time to save for the extra cost but it is far better to do it right the first time. Send me an e-mail and I will send you a invite to my dropbox so you can see a full drum room build.